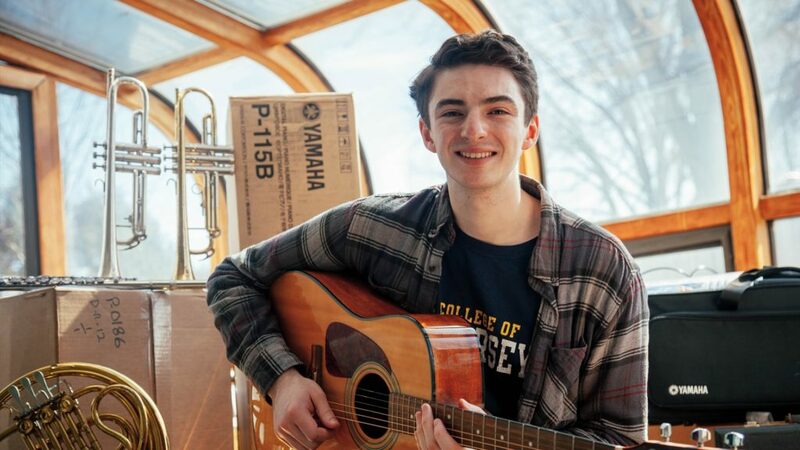 TCNJ music major Chris McEwan was exposed to various genres of music at a very early age and realized quickly the impact that music can have on a young person’s life. So when he started observing music classes in public schools in Trenton as part of the curriculum for his major, he immediately sensed additional resources were needed to help inspire students interested in music. McEwan, along with some help from his Phi Mu Alpha Sinfonia fraternity brothers, launched a campaign to raise money and collect used instruments to help support music programs in the public schools in Trenton. “We realized that these programs could really benefit from more supplies, so I brought the idea to my fraternity, and we started planning right away,” McEwan said. McEwan, himself a violinist and horn player, launched a GoFundMe page in November 2017 and also set up points on campus to collect donated instruments, music books, and other supplies. In just five weeks the group had secured $2,000 in cash donations and over $10,000 in instruments and other supplies, far exceeding their modest initial goal of $250. McEwan was stunned at how fast the donations were collected. 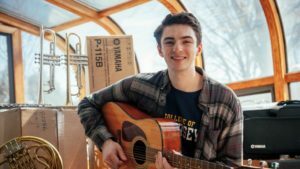 McEwan, who is about to complete his junior year at the college, received tremendous support from his classmates and the faculty of the TCNJ Department of Music. McEwan, a native of Wall, NJ, and his brothers from Phi Mu Alpha attended a Trenton School Board meeting in March and formally announced their donations to three Trenton schools: Trenton Central High School, Dunn Middle School, and Hedgepeth-Williams Middle School. The equipment was delivered to the schools in April. “When we presented our donation to the Board of Education, the parents and administrators made their appreciation known as well,” he said. The group plans to launch another campaign in spring 2019 to help additional schools around the Ewing and Trenton areas bolster their resources for music education. McEwan plans to pursue a career as a high school orchestra director once he graduates from TCNJ. ← Dr. James Day will be saying farewell to TCNJ this summer to begin his new role at Gettysburg College.